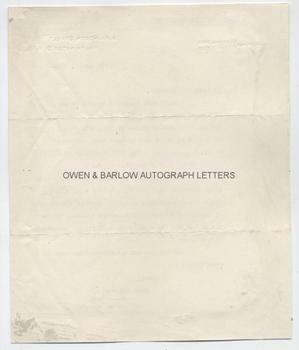 DAVID LLOYD GEORGE Typed LETTER Signed. TLS. 1p. 18 Abingdon Street, Westminster, S.W.1. 10th April 1924. To Henry Woodall. "I very much regret I cannot be at Llandudno with my friend Dr. Macnamara on Friday. 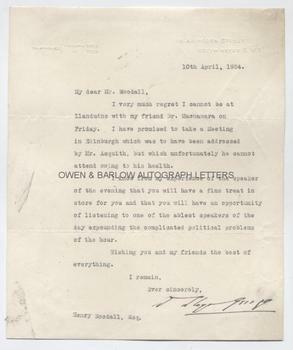 I have promised to take a meeting in Edinburgh which was to have been addressed by Mr. ASQUITH, but which unfortunately he cannot attend owing to his health. I know from my experience of the speaker of the evening that you will have a fine treat in store for you and that you will have an opportunity of listening to one of the ablest speakers of the day expounding the complicated political problems of the hour. Wishing you and your friends the best of everything." 4to. Approx 9 x 7.5 inches. Slight creases and marks and with slight mounting traces to verso, else fine. Henry Woodall was the son of the radical Liberal M.P., William Woodall (1832-1901). His father had held junior ministerial posts under W. E. Gladstone and Lord Rosebery. Dr. Macnamara is Thomas Macnamara (1861-1931), known as "Fighting Mac". He was a fervent Lloyd George supporter and was the first Minister of Labour in Lloyd George's cabinet of 1920. Lloyd George was a tough, energetic politician who led the country throughout WW1. He is regarded as the founder of the welfare state and in a recent poll of academics, was voted the 3rd greatest British Prime Minister of all time.